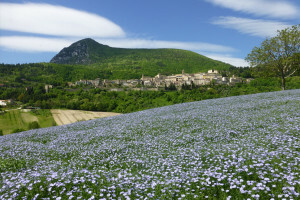 Le Marche occupies a zone which in 50 Km takes you from the Appennine Mountains to the sea, by way of rolling hills. 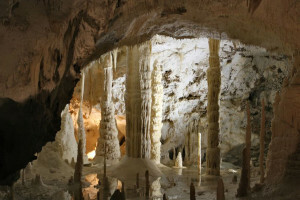 Our Country House is located just 7 Km from the Caves of Frasassi, the subterranean jewel of the Natural Park ‘Gola della Rossa e di Frasassi’. The same sulphurous waters that enabled the creation of the spectacular and suggestive formations in the Caves have given rise – within the Gorge itself – to a thermal spa complex of significant health-giving importance. Less than 50 Km away you find the Adriatic Sea with splendid beaches such as the Conero Riviera and Senigallia’s Velvet Beach. In this hilly area at the foot of the Appennines you can go hiking, mountain biking or horse riding on waymarked trails both in the mountains and along the banks of the Esino river in all the area of the previously-mentioned Natural Park. For the more experienced there are rock faces to climb in the Red Gorge and the Frasassi Gorge and in the ‘rock gym’ of Mount Revellone at Castelletta, and also launch sites for parapenting and hang gliding such as Monte Murano – all of these in the immediate area. You can visit perfectly preserved thousand-year old abbeys, hermitages and rural churches of ancient origin (‘The Path of Faith’ trail), stroll through well-preserved historic rural hamlets and castles and fortified villages in dominant positions over the valleys. 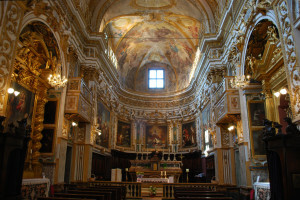 One of the most important villages of the Esino valley is Serra San Quirico, with its historical and cultural riches such as the complex of Santa Lucia which houses the headquarters of the Park, the main museums (Regional Historical Maps and the Museum of Fossils) and above all the church of Santa Lucia adorned with paintings, stuccos, decorations and gold leaf: a true jewel of the Baroque period. And don’t forget the walk around the city walls through “the Copertelle”, characteristic passages leading to the Cassero, the tower fortress that dominates the town. 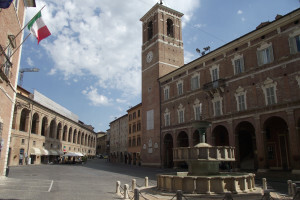 In the nearby towns there are noteworthy art galleries and museums such as that of Paper and Watermarks in Fabriano, the paleontological museum at Genga San Vittore and the art galleries of Jesi and Fabriano. Among these ancient fortified villages there is no lack of places to eat and wine outlets where you can taste traditional local wines such as the famous Verdicchios of “Castelli di Jesi” and “Matelica”, as well as Esino DOC, Rosso Conero and Lacrima di Morro d’Alba, and local foods rooted in the peasant tradition that has never been out of fashion in these parts.